An estimated 2,000 people have gathered in Lower Manhattan, New York, for the largest protest yet under the banner Occupy Wall Street. Demonstrators marched on New York's police headquarters to protest against arrests and police behaviour. Several hundred people have camped out near Wall Street since 17 September as part of protests against corporate greed, politics, and inequality. Earlier, UK band Radiohead were forced to deny rumours they would appear live. A tweet sent out by a Twitter account linked to the protest movement set off a firestorm of online interest. But a spokesman for the band later denied they were planning to appear, and the group themselves denied the rumour on Twitter. "We wish the best of luck to the protesters there, but contrary to earlier rumours, we will not be appearing today at #occupywallstreet," @Radiohead tweeted. The Occupy Wall Street movement has set up its base camp in Zucotti Park, a privately owned patch of land not far from Wall Street. Hundreds of people have camped out in the park since 17 September. The loosely organised group says it is defending 99% of the US population against the wealthiest 1%, and had called for 20,000 people to "flood into lower Manhattan" on 17 September and remain there for "a few months". Some 80 people were arrested during a march on 25 September, mostly for disorderly conduct and blocking traffic, but one person was charged with assaulting a police officer. Friday's protest numbers were swelled by local trade unions and by those attracted to the area by the rumour of Radiohead's attendance. New York's police have come in for criticism by the movement since video emerged of pepper sprays being used against demonstrators last weekend. "NYPD protects billionaires and Wall Street," read one placard carried aloft on Friday, the AFP news agency reported, as crowds marched towards the city's police headquarters, where they rallied peacefully before dispersing. New York Mayor Michael Bloomberg used his weekly appearance on a radio show to criticise the protesters, saying they were targeting the wrong people. "The protesters are protesting against people who make $40,000 or $50,000 a year and are struggling to make ends meet. That's the bottom line," he said. "We always tend to blame the wrong people. We blame the banks. They were part of this, but so was Freddie Mac and Fannie Mae and Congress and you and me and everybody." 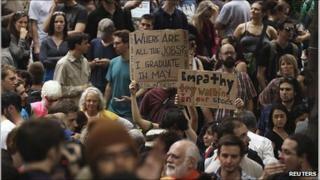 A series of other small-scale protests have also sprung up in other US cities in sympathy with the aims of Occupy Wall Street. The movement's website on Friday said a Boston movement had begun, with other reports online suggesting a sit-in was due to begin on Saturday in downtown Washington DC.